The bottom line is that after two years of turmoil beginning in the winter of 2011 Mohammed Morsi remains under what the Times describes as "indefinite detention," Hosni Mubarak has moved from jail to house arrest “Mubarak to Be Transferred to House Arrest,” NYT, 8/21/13) and the military is still in power. These are the events that are narrated in Jehane Noujaim’s documentary, The Square, currently playing at Film Forum. Of course, the title referring to Cairo’s Tahir Square, the epicenter of unrest during the initial rebellion against the Mubarak dictatorship, also conjures up the memory of Tiananmen Square, where the Chinese movement was crushed in l989. 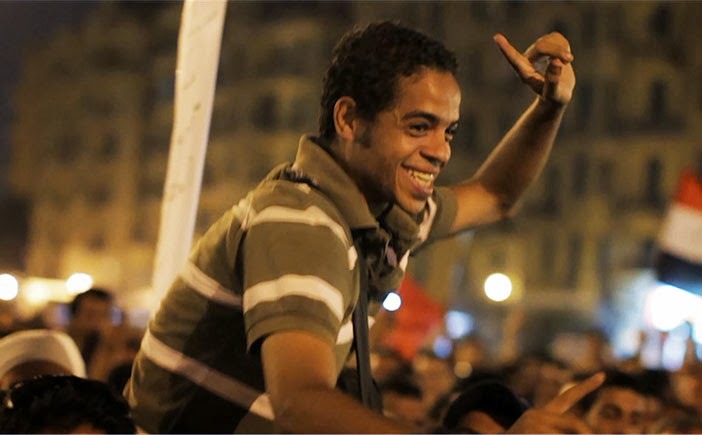 Politically, both Arab Spring, of which the Egyptian uprising was a part, and the early rebellion in China both emanated from the same impulse--the struggle for human rights. The Square is a jeremiad since it betokens the tragic fate of many freedom movements in which resistance to authoritarianism becomes so ideologized that it spawns its own forms of repression. That’s what’s happening in Syria where Al-Qaeda and other fundamentalist factions have co-opted the opposition. Who knows if parliamentary democracy would have been the product of a successful people’s revolution against the party elite in China? The narrative of The Square is told in microcosm through the eyes of Ahmed, a streetwise agitator, Khalid an actor (who has starred in films like The Kite Runner) and Magdy, a member of the Muslim Brotherhood, the most torn of all the characters, precisely due to a political agenda—which increasingly puts him at odds with his confreres. The Square recapitulates the sickening history of freedom movements from the Russian Revolution on, with the early millenarian fervor attendant upon shocking degrees of naivete. While one has to admire the courage of the protestors, one wants to give them a history lesson—or two. Have they never heard of an Italian sociologist named Vilfredo Pareto and his concept of “the circulation of the elites?” Have they never heard the expression that that power is conservative and self-perpetuating, no matter how lofty the ideals it seeks to uphold? The film is rather straightforward and earnest, but there’s one exception and that’s the intermittent cross cuts to a mural that’s constantly being painted by an unidentified hand. This brilliant little touch links the film to the works of painters as varied as Goya, Orozco and Picasso and their narratives of human suffering. Great insight into the problem with 'revolutions' which so often substitute one power structure for another, with the citizens as the losers. The 'Tank Man' video is one of the most moving and profoundly heroic depictions of human spirit I've ever seen and offers an interesting strategy for protestors. A thousand (or million) angry voices are a mob, but one person confronting power is a potent symbol and one that despotic institutions are reluctant to quash publicly. 'Democracy' has become, in this country, a winner-takes-all power grab and the inherent problem is that there is no braking mechanism to prevent an angry and misinformed public, manipulated by clever public relations fear-mongering, from taking control.